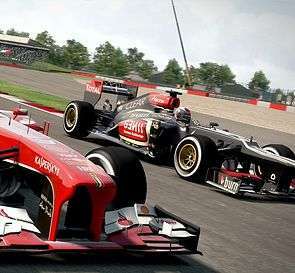 With F1 2013 launching itself off the grid on the 4th of October, I caught up with Greg Pryjmachuk of Codemasters, and scrutinised him about the difficulties of balancing simulation and gameplay, team orders and the possibility of an F1 management sim. With new rule-sets in place for this year, specifically DRS only being used on selected straights rather than everywhere on the circuit during practice and qualifying, what kind of changes to the handling have you made this year? Quite a lot, because the season’s changed quite a bit this year. We’ve seen McLaren drop to the middle of the table, so they’ve taken a hit in the game; early on in the season Mercedes were struggling with tyres, so if you play as their car they’re generally far more aggressive on them, and the Red Bulls have better traction coming out of corners. We’ve just tried to give a better identity to each of the teams, and after that most of the resources have gone on the Classics mode, because the difference between years is incredible. One of the early Williams has active suspension, so it’s like driving a Scalextric around the track; it just stays there. There’s a far more pronounced difference with the tyres, how much of that was inspired by the data from Pirelli and how much to spice up gameplay? Pirelli are very closed on the information they give about the tyres, so you don’t get much from them, but we bought tyre scaling back. So, it simulates every race no matter what distance you go, so there’ll be marginal two or one stops, or whatever you want to risk. The research we did on it came from watching the early season, but we’ve not done anything like the exploding tyres from Silverstone, because I don’t think that was fun for anyone at that race! So they’re more inspired by the high-degradation sets from earlier in the year than the Kevlar sets? It’s very much so. Even your Race Engineer will get your strategy wrong every now and then, and so there’ll be cases where you have to start nursing them now. Considering Pirelli only release tyre sets three races at a time, how do you guess which ones they’ll use for the second half of the season? We generally go with what they did last year, but we are constantly changing them if need be. I think we just had to change the Singapore sets because they changed, as well as ‘The Sling’ being removed in the Singapore circuit. Was that a nightmare scenario when you’re committing to making a simulation? Well, it was fairly early on that we knew that, so we got that change done pretty quickly. The big worry was they were talking about Nürburgring not showing up because Ecclestone had some legal problems over there, so we didn’t know whether to update the German Grand Prix or not! Last year, I was told that the AI was programmed to be much closer in terms of skill to mimic the manic opener when seven drivers won seven different races, but this year Vettel’s been dominating to a point, and it’s kind of boring. 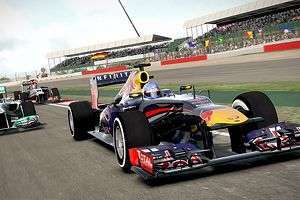 Can we expect to see Vettel charge away every race as in reality, or will the races be a lot closer? Nah, some of the races I do Hamilton’s up there, Alonso’s up there, and I’ve had a few Raikonnen victories as well. We’ve tried to mimic the earlier season a lot more, because I don’t think anyone predicted Vettel coming out and having a higher top speed than the Mercedes. The Spa straight just broke my heart, seeing him take over just like that, I thought “Here we go, another Vettel win!”. But, what we’ve done with the AI this year is to make them more aggressive; you’ll probably see more accidents occur on the circuit, but they will try for the overtake on places like Eau Rouge, which we haven’t done before. They know how to close the door when you get close to them, and we’ve got a canned events system now, so they have accidents. I’ve seen Maldonado go into Rosberg before and send a tyre charging my way, which is pretty funny. Do certain drivers have specific behaviours? For example is, say, Perez better on his tyres than Button, do some brake later into the corners, or are Maldonado and Grosjean more accident prone? We do have some driver personalities, one we did have was Grosjean being a bit more aggressive, but he seems to have calmed down a lot more over the season, so we’ve had to adapt him a bit. It’s very subtle things that won’t dominate the race, you won’t be saying “oh, here comes bloody Maldonado!”, they all rely on the events system, so it’s a random chance for their behaviours to be affected. How does the Young Driver Test work this year? Is it the same as last year, or is it easier to get a drive with a more successful team? It’s the same structure; you do the tests and get graded on them. We’ve tried to revamp it a bit so it feels more gamey, so you get your Bronze, Silver and Gold medals and there’s actually a gameplay and skill element to adapt to it, so it’s not just teaching you the game. I think the highest car we give out at that level is the Lotus, I think, but you can switch over mid-season if you’re really performing well. We do mid-season updates where the teams look at your performance again, but what we’ve done is added another AI difficulty between the highest difficulty and the second-highest, because there was a big leap there. Players with pads would be using the second-highest difficulty and still be winning by a big margin when they shouldn’t, and then when they jumped up to, I think it’s Professional, the margin would be too hard and ridiculous unless you had a wheel. Is there still going to be that rubber-banding on higher difficulties? Well, we stuck the AI difficulty right between the two, so it gives a new level of gameplay. Are there team orders like the infamous “Fernando is faster than you” or “Multi21, Seb”? We did look into it, but we thought that if it affects the player, a lot of the time you choose to ignore it, and that would give up quest trees where different events will happen in the career, and it’s something we didn’t have time for with all the classic content this year. Is it something you’d want to consider in future, then? Oh, definitely. We want to look back at the career mode in future and really revamp it. With Scenario mode replacing Champions mode, was there any temptation to have those scenarios replicate real life events or races? We certainly do, one of the scenarios is based off Button’s win in the wet in Montreal, where you’ve got to bring it back in heavy rain conditions and beat Seb. This year, we’ve played more on the relationship between Seb and Button in that race. I mean, you don’t play Button, you play yourself, but the Race Engineer will coax you into that battle and so it feels more personal and story-based. Is there a good balance between reality and fantasy? Yeah, there’s a good deal of stuff we’d like to see in the sport as well. Speaking of ‘what if’ scenarios, the classic cars are one of the biggest changes to the series, but how were you able to make their handling and traction authentic considering how old the cars are? Well, some of the cars have turbos in them, and that’s something we’d have needed to look at next year anyway with the new cars, so that’s something we did with the physics engine this year. We looked at incorporating turbos, but we didn’t have to start from scratch because the DiRT team had turbo injectors in their games, so we had to look at that and use some of that tech and put it in, then just keep iterating and iterating and iterating. It look a very long time to get all the different cars on the grid working fair enough but knowing there’s a difference in performance. There’s the FW07, the 1980s’ car, it was a Championship-winner in its day, but even up against the Lotus 100T, which wasn’t the best car that year, there’s a massive difference. 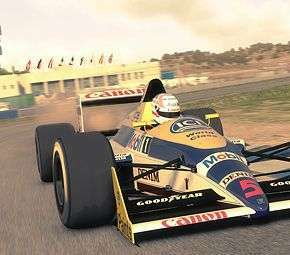 Were there any particular cars, teams or tracks you wanted to include, but couldn’t? Yeah, we really wanted to get McLaren in, but they’ve got an exclusive deal this year with one of the online racing games. 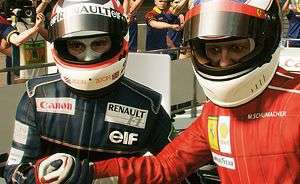 We’ve tried to make it a game within itself, so we’ve got the Williams and Ferrari rivalry in the 90s, and we focused on that, because we didn’t want to be the guys just sticking in one car in the time trial event. What was it like to work with Murray Walker for the classics mode as well? He’s like an office legend! I write the VO for the commentaries as well, so not only did we just do the intros and outros, but we got him to do some ‘Murrayisms’ as well! Have you ever considered having commentary to get a better idea of what’s going on in the rest of the field, who’s retired or are having a skirmish ahead you might be able to wade into? 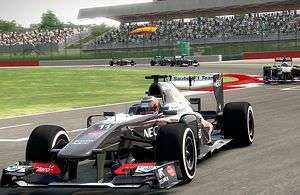 We’ve looked at that, and I know previous F1 games have done it in their versions, but the whole reason we went with radio engineers in the first place was because it’s very player-specific, and we can take it into bigger places in the future, so we could potentially include voice commands with the race engineers, whereas it’d be a one-way relationship with the commentary. Have you ever thought of adding more of a management aspect? Maybe a different mode where you get to manage the teams? Yeah, but it’s time at the end of the day. We’ve looked at doing things on other devices like management games, but it’d have to be a new studio that did that because you have to go through FOM and you have to get everything approved. We’d like to do stuff like being able to choose your own sponsor for a car, but having FOM say “Yes, you can have Vodafone on a Ferrari” is very difficult to approve. Considering the radical rule changes they’re putting in place for next year, are you prepared, or nervously waiting for how different the experience is going to be? We’re up to date on how we can incorporate the turbos, that’s pretty good, but we’re worried about how different the cars are going to be with the V6 engines. We’ve all got theories in the office that Mercedes are going to be the ones to watch next year, because they’ve seemingly had this four year plan: getting Ross Brawn, getting Hamilton and they seem like they’re heading in that direction. Other than that, it’s just a matter of waiting and trying to keep an eye on the Young Driver’s test and things like that. Finally… Vettel or anyone else to win the Championship? I sat watching Spa with my Kimi Raikonnen hat on, waiting for him to get another consistent third place, but he retired that so my dreams were dashed there. It’s going to be Vettel again. I don’t justify all the boos he’s been getting, but I can see why they are there, especially with the ‘Multi21′ incident. Seb said at the end of the Singapore Grand Prix “the boos came to Shanghai, they’re invited to Korea as well”, they’re going to be there as well, Seb.